Where else but in “The Heart of Screenland” can you drive around the city, search for specific locations and learn about Culver City history all at the same time? 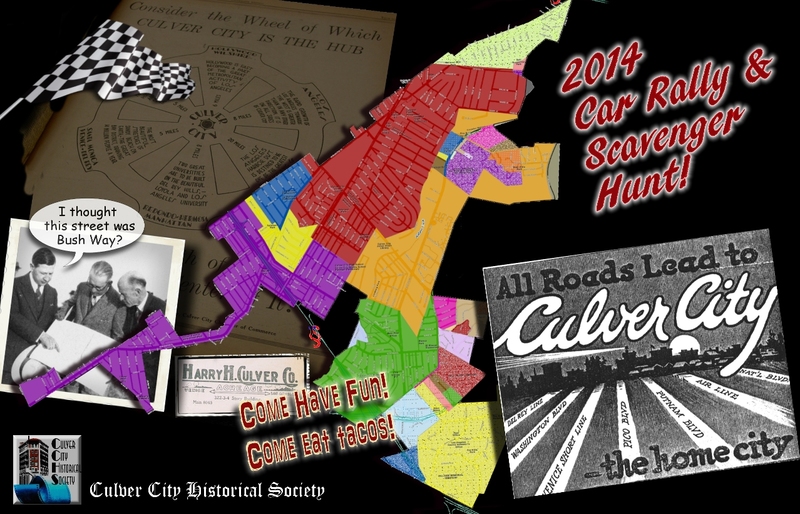 The Culver City Historical Society invites you to join the fun when it presents its Scavenger Hunt/Car Rally fundraiser on Sunday, September 21, 2014, from 3-6 pm. Participants will start at the Society’s Archives and Resource Center in back of the Veterans Memorial Building at 4117 Overland Avenue, check in, receive their tickets and first set of directions. From there, you will have a fun-filled adventure driving from one place to another to receive their next set of clues, learning facts about local history along the way. The final checkpoint will feature tacos, a no-host bar, and a 50/50 raffle for all who attend. The cost for this fun-filled adventure is $30 for Historical Society members; $35 for non-members and $10 for children from 6 to 12 years. Reservations must be pre-paid and all RSVPs and checks (payable to the Culver City Historical Society) must be sent by September 15 and sent to Culver City Historical Society, P.O. Box 3428, Culver City, CA, 90231-3428. Click here for a printable Scavenger Hunt reservation form, and reservations will be accepted on our next open Sunday, September 7. For safety, groups /cars of more than one person are encouraged. The ARC will be open for viewing from 1 to 3 p.m. that day. For questions, call 310-253-6941 or send an email to info@culvercityhistoricalsociety.org.